Guaranteed lowest prices for three great meat products and one of them is BOGO Free deal! Buy raw shrimp for the best price at Albertsons this week. While it's winter, people struggle with an illness like flu and cold. Vitamin-C is an essential compound that your body needs to maintain itself strong. Orange juice and clementine mandarins can help you get your need of Vitamin C. If you feel like a bit dizzy or weak, I recommend eating some mandarins on a daily basis. It's on sale at Albertsons. If you browse Albertsons Weekly Ad you will see that you are able to buy 3 lb. bag for only $3.47! Keep your body warm in the morning cold with a fine cup of coffee. Green Mountain coffee K-cups is a great choice and the cost is only $10 for 2 including Peet's coffee. Dasani Water, Signature SELECT corn or Green beans, Keebler or Famous amos cookies are also on the first page of this Albertsons Ad. Digital coupon savings are also profitable discounts from this ad. Cottonelle bath tissue, Flushable cleaning clothes, Scott bath tissue, Kleenex facial tissue viva paper are great digital coupons. Find a lot of new Monopoly Bonus Ticket items on pg 2. Hormel chili, Italian style bread crumbs, Jif peanut butter, Jif power ups, and many more products are bonus items. If you stay with your friends and family, it might be a good idea to fill your fridge with some soda packs like Red Bull, Dr Pepper, Coke, Pepsi, and more brands. Explore more deals on grocery, dairy, and frozen foods on pg 4. Restock yoghurt, waffles, delights muffine or croissant at lower prices by Albertsons. Browse also the non-food parts of the ad for a great price. Signature Care personal care products are available on pg 5. Easter products are already available at Albertsons. You can follow our Facebook page for future deals and posts like these. Monopoly bonus ticket items deal is again one of the best deals of the week at Albertsons stores. This Ad contains a lot of those bonus items. Price drops and lowest prices of meat, fresh fruits, snacks, pantry products are in the new Albertsons Weekly Ad. Eggs, bread, milk, salad kits, orange, strawberries, 80% lean ground beef are promotions on the first page. And more is also available. Raw shrimp will be only $5.47/lb. with a price guarantee by Albertsons. Get 1 free gallon Lucerne milk for buying Kellogg's Cereal, Nutri Grain bars or Pop Tarts. Lunchables are 10 for $10 deal this week. Another nice deal is Classico pasta, Alfredo sauce or Barilla pasta. Check out these items on the first page. Go to pg 2 for Monopoly bonus ticket items. Plenty of products chosen from snacks, beverage, breakfast, pantry and grocery are available within the range of bonus ticket items. Multiple buys, 10 for $10 sale, favorite products and more are available on pg 2. Beverage packs such as Coke, Sprite or Dr Pepper, Dasani Water, Red Bull Energy drinks, are on the pg 3. Much more than this is possible to find in the Albertsons Ad. You can earn gifts of How To Train Your Dragon with your purchase featured in Albertsons Weekly Ad. The new sale covers guaranteed lowest prices, weekly discounts, BOGO Free deals as usual. Monopoly bonus ticket items is still an ongoing deal at Albertsons. Besides, you may earn a lot of digital coupon rewards. For example, buy Nabisco premium crackers $1 cheaper with a coupon. It's a Monopoly Bonus Ticket Item. Many more bonus items are also available on pg 2. In that page, you can easily see the prices of Coca-Cola packs, Nabisco cookies, Lay's chips, Triscuits, Starbucks coffee ground or K-cups, and much more. Prices of Atlantic salmon fillets and chicken breast fillets are guaranteed lowest values. Boneless chuck shoulder roast is BOGO Free this week. The same deal is valid on Blueberries, too. Find orange juice, Lucerne milk, Kellogg's cereal on the first page. 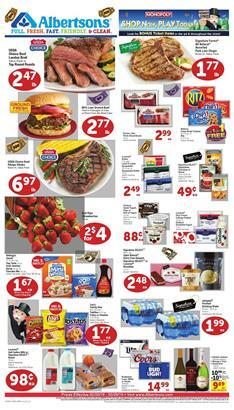 Dairy and Frozen sale, life essentials and more weekly supplies of the weekly ad can be browsed on pg 3-4. Albertsons offers a deli, bakery, and household supplies on pg 5. Hershey's candy bar varieties will cost 2 for $1! Hershey's Gold, KitKat and more candies are covered items.